Believe: Unity Stamps and My Sweet Petunia Collaboration Hop! Unity Stamps and My Sweet Petunia Collaboration Hop! Hello friends!! Hope you all are having an amazing day! 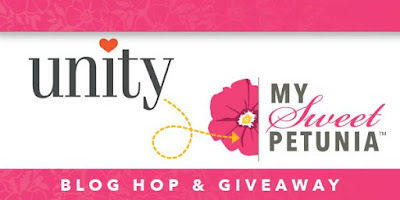 Today is a very special day, the My Sweet Petunia and Unity Stamp Company are joining forces to bring you a LOT of inspiration, ideas and prizes! First let me show the projects I created for you. For this card I used Special Delivery Mouse and of course my Misti. I wanted to use this super cute frame so I placed it on top of my piece of white cardstock to know exactly where to stamp the image. I used Black Ink and colored the image with Copic Markers. After that, just removed the stencil and reveal the perfect blended ink circle. Using a marker create a little shade under the mouse. I added Crystal Lacquer on the Special Delivery sign and bucket, also added Clear Stickles to the flowers and little leaves. Adhered the die-cut frame with foam adhesive and added the panel to a 6" x 6" White card base. I decided to created an extra project, here I used "A Time of Peace"
Then I used a Marvelous Mask Rectangle Stencil and blended Fossilized Amber Distress Oxide and Tumbled Glass Distress Inks with a soft brush. After that I used Falling Stars Stencil and Fossilized Amber Distress Oxide ink. I added a little extra pressure to get the stars really popped! Stamped the sentiment on a piece of white cardstock in Sienna Ink. Tied gold thread on strip and added the sentiment to panel with foam adhesive. You can find the whole list of participants clicking the Unity Stamps and My Sweet Petunia lists. And a hop is not a hop without prizes, right? My Sweet Petunia is giving away a $60 gift certificate. Hi Donna! I just fixed the link. Thanks for letting me know. Hugs! Oh wow!! That frame is STUNNING and I love you created that card with layers. The background on your second card is gorgeous. Coloring on both images - just lovely. Thank you so much for sharing! I love the new release. I love your coloring and designs. Just wonderful projects. Happy Holidays! I really enjoyed both of your cards! The frame on Special Delivery is stunning and the star stencil on A Time of Peace is a beautiful addition. The Misti is an absolute must have for all stampers imho. Thanks for sharing! Love these images and the colours are great as well! Love these cards....this is one awesome blog hop! Darling cards--loving these so much! Your cards are amazing!! The mouse is so cute and could only accomplish centering him by using the Misti. How you added the stars with the stencil turned out beautiful on the Peace card. I am not Unknown because my name is Carol Parker. I don't know why my name comes out as unknown!! Wonderful cards! Love the cute mouse and the sweet angel. Love your cards. They are amazing! Love the die cut around the mouse. Super cute! love the card designs with these adorable images. Adorable cards! Thanks for sharing your creativity!! You've shared two lovely cards today. Beautiful framing of the special delivery mouse. Two beautiful cards!! Love the way you framed your mouse! Very pretty cards! I really love the special frame that you have around the adorable mouse! Very elegant looking! Your cards are adorable. I especially love your coloring! Wow! That mouse and that amazing die cut on that card. Love the coloring on that second card too. Very nice detail and beautiful colors. Wow that die cut really makes the stamped image the focus. Love it! Great cards. I will have to try using a soft brush instead of a blender sponge because I like the effect you have on your cards. Amazing cards. Love the layouts. Fabulous coloring on both and I like the die cute frame on the first one. Beautiful cards Giovana. Love the scrollwork frame around the little mouse. Beautiful coloring. Thanks for the inspiration! Lovely cards! Beautiful coloring and sweet designs.